Is Turkey Leaving the West? N.B. : Washington Times title: "Trading Europe for the Shanghai Five Turkey dissembles over joining the EU"
Recent steps taken by the Government of Turkey suggest it may be ready to ditch the NATO club of democracies for a Russian and Chinese gang of authoritarian states. 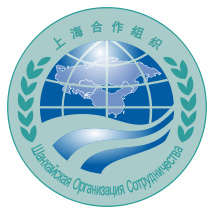 The Shanghai Cooperation Organisation's logo (in Chinese and Russian). Starting in 2007, Ankara applied three times unsuccessfully to join as a Guest Member of the Shanghai Cooperation Organisation (or SCO, informally known as the Shanghai Five). Founded in 1996 by the Russian and Chinese governments, along with three (and in 2001 a fourth) former Soviet Central Asian states, the SCO has received minimal attention in the West, although it has grand security and other aspirations, including the possible creation of a gas cartel. More, it offers an alternative to the Western model, from NATO, to democracy, to displacing the U.S. dollar as reserve currency. After those three rejections, Ankara applied for "Dialogue Partner" status in 2011. In June 2012, it won approval. 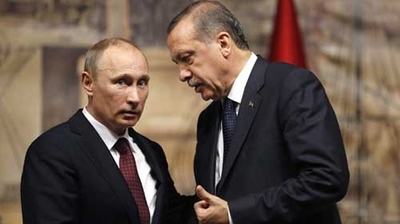 One month later, Turkish prime minister Recep Tayyip Erdoğan reported about his saying to Russia's President Vladimir Putin, "Come, accept us into the Shanghai Five [as a full member] and we will reconsider the European Union." Erdoğan reiterated this idea on Jan. 25, noting stalled Turkish efforts to join the European Union (EU): "as the prime minister of 75 million people," he explained, "you start looking around for alternatives. That is why I told Mr. Putin the other day, 'Take us into the Shanghai Five; do it, and we will say goodbye to the EU.' What's the point of stalling?" He added that the SCO "is much better, it is much more powerful [than the EU], and we share values with its members." 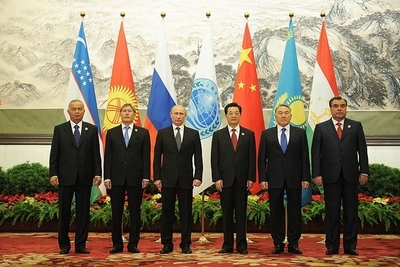 Heads of the six SCO states meeting in Beijing in June 2012. On Jan. 31, the Foreign Ministry announced plans for an upgrade to "Observer State" at the SCO. On Feb. 3 Erdoğan reiterated his earlier point, saying "We will search for alternatives," and praised the Shanghai group's "democratization process" while disparaging European "Islamophobia." On Feb. 4, President Abdullah Gül pushed back, declaring that "The SCO is not an alternative to the EU. ... Turkey wants to adopt and implement EU criteria." What does this all amount to? The SCO feint faces significant obstacles: If Ankara leads the effort to overthrow Bashar al-Assad, the SCO firmly supports the beleaguered Syrian leader. NATO troops have just arrived in Turkey to man Patriot batteries protecting that country from Syria's Russian-made missiles. More profoundly, all six SCO members strongly oppose the Islamism that Erdoğan espouses. Perhaps, therefore, Erdoğan mentioned SCO membership only to pressure the EU; or to offer symbolic rhetoric for his supporters. Russia's Putin and Turkey's Erdoğan: two birds of a feather? Both are possible. But I take the half-year long flirtation seriously for three reasons. First, Erdoğan has established a record of straight talk, leading one key columnist, Sedat Ergin, to call the Jan. 25 statement perhaps his "most important" foreign policy proclamation ever. Second, as Turkish columnist Kadri Gürsel points out, "The EU criteria demand democracy, human rights, union rights, minority rights, gender equality, equitable distribution of income, participation and pluralism for Turkey. SCO as a union of countries ruled by dictators and autocrats will not demand any of those criteria for joining." Unlike the European Union, Shanghai members will not press Erdoğan to liberalize but will encourage the dictatorial tendencies in him that so many Turks already fear. Third, the SCO fits his Islamist impulse to defy the West and to dream of an alternative to it. The SCO, with Russian and Chinese as official languages, has a deeply anti-Western DNA and its meetings bristle with anti-Western sentiments. For example, when Iran's President Mahmoud Ahmedinejad addressed the group in 2011, no one rejected his conspiracy theory about 9/11 being a U.S. government inside job used "as an excuse for invading Afghanistan and Iraq and for killing and wounding over a million people." Many backers echo Egyptian analyst Galal Nassar in his hope that ultimately the SCO "will have a chance of settling the international contest in its favor." Conversely, as a Japanese official has noted, "The SCO is becoming a rival block to the U.S. alliance. It does not share our values." Turkish steps toward joining the Shanghai group highlights Ankara's now-ambivalent membership in the North Atlantic Treaty Organization, starkly symbolized by the unprecedented joint Turkish-Chinese air exercise of 2010. Given this reality, Erdoğan's Turkey is no longer a trustworthy partner for the West but more like a mole in its inner sanctum. If not expelled, it should at least be suspended from NATO. Feb. 6, 2013 addenda: (1) Whoever first came up with the various Shanghai sobriquets for the Russian-Chinese organization probably did not realize that in English the verb to shanghai means "to force or trick (someone) into doing something, going somewhere, etc." How appropriate a nuance for this semi-rogue sextet! Were it not an obsolete term, I would have titled this column Shanghaiing Turkey. (2) Asked about Erdoğan's remarks, a spokesperson for the European Commission, Peter Stano, declined directly to respond, confining himself to noting that comments suggesting that Ankara would give up its EU bid to seek other options are "speculative." The secretary general of the Council of Europe, Thorbjorn Jagland, took the remarks in stride: "I may be mistaken, but Prime Minister Erdoğan's remarks actually represent a call to Europeans to assume a more constructive and positive attitude toward Turkey." (3) The main opposition leader, Kemal Kılıçdaroğlu of the Republican People's Party (CHP) rejected the SCO gambit on Feb. 4: "The proposal to become a member of the SCO is inconsistent and incorrect. We turned our direction to the West, not to the East. This is not something new, since 1071 our goal is [to head] toward the West. We don't mean geography in saying the West but modernity and civilization." The Battle of Manzikert took place in eastern Anatolia year in the 1071 and marked the first Turkic military victory in Anatolia. "We see the EU as a modernization project." (4) Erdoğan yesterday offered an explanation for why the EU has not allowed Turkey to join its ranks: perhaps the union was "hesitant because the members will not be able to do everything they want when Turkey gets in." His clear and mildly astonishing implications are that (1) Europeans without Turks are irresponsible and (2) Ankara intends fundamentally to change the EU upon entry. (5) Noting "Are we not in NATO with these countries?" Erdoğan went on in the same comments to note that Turkey, as the only NATO country with a majority Muslim population (which it is not: Albania also is), "would stop wrong steps [in NATO]. Thus, we saw such steps toward Israel's inclusion in NATO. We prevented that. We have our own red lines. For us, to be involved in NATO with Israel is never acceptable. To be with such a cruel understanding would conflict with our structure, history and culture." Not only is Erdoğan asserting he kept Israel out of NATO but he is claiming to have a decisive role in NATO – something I find quite credible. When added to Erdoğan's Shanghai gambit and Foreign Minister Ahmet Davutoğlu's paraphrased threat a few days ago that "Turkey would not stay unresponsive to an Israeli attack against any Muslim country," these comments point to a headstrong Turkish leadership that feels it can say and do pretty much anything it pleases. And it can. (6) Judging by comments made yesterday in Hungary, Erdoğan seems not to give a fig anymore what Europeans think. Speaking about the internationally-recognized Republic of Cyprus, he announced that "south Cyprus is not a state, it's an administration. There is no such thing as Cyprus as a country. There is the Greek Administration of South Cyprus and there is the Turkish Republic of Northern Cyprus on the north of the green line." Apr. 28, 2013 update: For updates on this topic, see my weblog entry: "Ankara Flirts with the Shanghai Cooperation Organisation."